Simplify the end of the day with our Easy Chicken Dinner recipe. 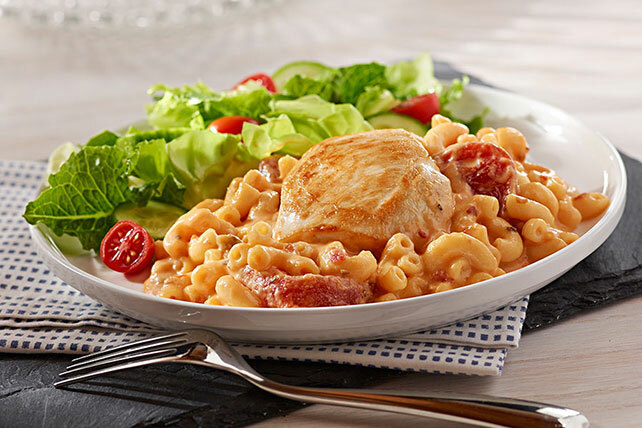 Our Easy Chicken Dinner is so simple and tasty it may become one of your go-to recipes. Heat 1 Tbsp. oil in large nonstick skillet on medium heat. Add half the chicken; cook 5 to 6 min. or until done, stirring frequently. Remove chicken from skillet; cover to keep warm. Repeat with remaining oil and chicken, adding second batch of cooked chicken to first batch of cooked chicken. Add macaroni, water, milk and butter to skillet; stir. Cook 8 to 10 min. or until macaroni is tender, stirring frequently. Add cheese; stir until melted. Add tomatoes and seasonings; cook 2 min. or until heated through, stirring frequently. Return chicken to skillet; stir to evenly cover chicken with tomato mixture. Cook 1 to 2 min. or until heated through, stirring frequently. Omit oil, chicken, macaroni, water, milk and butter. Prepare 1 pkg. (7-1/4 oz.) KRAFT Macaroni & Cheese Dinner in large skillet as directed on package. Add tomatoes, oregano and crushed red pepper; mix well. Add 2 cups shredded rotisserie chicken; cook until heated through, stirring occasionally. Makes 4 servings. For a touch of heat, add chopped fresh jalapeño peppers to the macaroni mixture along with the tomatoes and seasonings.